Purpose: The main purpose of the study was to determine the extent of utilization of ANC services among childbearing mothers in Anambra State Nigeria and to determine the difference in extent of utilization by age and level of education. Method: 1250 childbearing mothers were used the study. A scaled 19-item Antenatal Care Services Utilization Questionnaire (ACSUQ) was used for data collection. Mean was used to answer the research questions with criterion mean of 2.5 and the hypotheses were tested using ANOVA. Results: Childbearing mothers utilize ANC services to a high extent and this differed significantly by age and level of education of the mothers. The finding also indicate that HIV/AIDS and STIs services were the least utilized, that mothers age 25-34 had the least ANC service utilization and that people with no formal education utilized ANC services more than those with primary education. Conclusion: These findings therefore, have implication for maternal health education considering the irreplaceable place of ANC services in the health of mothers and their children. Recommendations were made based on these findings which among others include call for intensification of behavior change communication program at all levels of health care to improve ANC services uptake. Antenatal, Age, Childbearing, Education, Mothers, Safe Motherhood, Anambra State. Since the launching of the Safe Motherhood Initiative, improving maternal health and reducing maternal mortality has continued to be the focus of many international health programs. For instance, improving maternal health is the 5th of the Millennium Development Goals (MDGs). This goal calls for a 75 percent reduction in maternal mortality between 1990- 2015. USAID global health Initiative (USAID) also targets reducing maternal mortality by 30 percent across all its assisted countries . The main objective of Safe Motherhood is ensuring that all women receive the care they need to be safe and healthy throughout pregnancy and child birth . One of the key interventions needed to meet the objective of safe motherhood and the MDG goal is antenatal care. According to WHO/UNICEF, antenatal care (ANC) is the care a woman receives during pregnancy which helps to ensure healthy outcomes for women and their newborns . It emphasizes that it is a particular form of care given to a pregnant woman and her baby starting from the time of conception up to the delivery of the baby. It includes regular monitoring of the woman and her baby throughout pregnancy by various means including a variety of routine regular examinations and a number of simple tests of various kinds. According to Fekede and Mariam it is potentially one of the most effective health intervention for preventing maternal morbidity and mortality particularly in places where the general health status of women is poor . Antenatal care services indirectly save the lives of mothers and babies by promoting and establishing good health before child birth and early postnatal period . In order to deliver on the health of mother and child, antenatal care provides an essential link between women and the health system and offers essential health care services in line with national policies which include provision vitamin supplement, vaccination, screening for risk factors in order to prevent complications where possible and to ensure that complications are treated appropriately . According to Jowett, antenatal care services can also prevent maternal deaths through screening for risk factors or the detection and treatment of complications. Antenatal care is still considered effective in identifying and treating causes of maternal deaths such as anemia, hypertension and infections. It also provides counseling about the danger signs of pregnancy and delivery complications and where to seek care in case of emergency, counseling on birth preparedness, emergency readiness, and the development of a birth plan; provides advice on proper nutrition during pregnancy, personal hygiene; dictates conditions that require additional care and providing appropriate treatment for those conditions . ANC also helps in detecting complications that influence choice of birth location, supplies Iron, Foliate and low doses of vitamin A supplement. In certain settings, ANC provides treatment for conditions that affect women’s pregnancies, such as malaria, tuberculosis, hookworm infection, iodine deficiency, and sexually transmitted infections, including HIV/AIDS. ANC provides tetanus toxin immunization, Information about breastfeeding, blood and urine analysis are also carried out during this period. Therefore, for a mother to be adjudged to have met the requirement for ANC, she must have made at least the four minimum ANC visits during pregnancy and accessed all these antenatal care services as her condition requires . In spite of all these preventive measures articulated through antenatal care, maternal mortality and morbidity is still a major issue in developing countries. Kurjak and Bekavac estimated that about 600,000 women die yearly from complications of pregnancy, child bearing and unsafe abortions worldwide and 99 percent of these deaths occur in the developing world . Indeed, the greatest discrepancy in all human development indicators is seen in the maternal mortality ratio between the developed and the developing world. Data from Nigeria indicate that the expected reduction in the maternal deaths to about 440 per 100,000 live births mid-way to the target date of achieving the MDGs fail short. WHO observed that maternal death in the rural areas in Nigeria was 828 deaths per 100,000 live births, and 531 deaths per 100,000 live births in urban areas. Disparity was wide on zonal basis, when this is compared to a projected target of less than 75 live births per 100,000 by 2015 . With this statistics therefore, the reduction of maternal mortality represents a major challenge to Nigeria health care system. One of the major challenges to reduction of maternal deaths is inadequate motherhood services such as antenatal care and extent of utilization of these services. According to Nwosu, Urama and Urakpa, approximately two-thirds of all Nigerian women and three-quarters of rural Nigerian women deliver outside of health facilities and without medically-skilled attendants present . Data from the NDHS collaborates this and indicates that about 39% of women of child bearing age did not receive antenatal care from a skilled provider, while only 51% made at least the minimum four antenatal visits during pregnancy . With this poor showing in accessing and utilizing ANC by child bearing mothers in Nigeria, the MDGs target of reducing maternal death may not be achievable, and the services provided for ensuring healthy outcomes for mother and child may be underutilized and this might have contributed to the observed maternal mortality and morbidity rates. Based on these, this study was designed to determine the extent of utilization of ANC services among childbearing mothers in Anambra State, Nigeria and whether utilization differ by age or by educational attainment. It will also test two hypotheses of no significant difference in extent of utilization by age and educational attainment of the mothers. A cross-sectional survey design was used for the study. According to Nigeria National Population Commission, the population of the women of child bearing age (15-49 years) in Anambra State was 932,911 . A sample of 1250 child bearing mothers selected from education zones in Anambra State, Nigeria, through a multi-staged sampling technique was used for the study. The instrument for data collection was the Antenatal Care Services Utilization Questionnaire (ACSUQ). A scaled instrument consisted of 19 questions divided into two sections; section one contain questions items on the socio-demographic variables of age and level of education of mothers, while section two contained 17 question items to elicit responses on the extent of utilization of specific ANC services offer during antenatal visits. The respondents were required to indicate on a 4-point scale, using always (AL), occasionally (OC), rarely (RA) and never (NE) to indicate extent of utilization of antenatal care services. The instrument was subjected to face validation by three experts in health education and measurement and evaluation. Based on the recommendation of these experts the final draft of the instrument was produced and used for the study. The internal consistency of the instrument (ACSUQ) was computed using Cronbach alpha co-efficient which yielded a reliability coefficient of .86. Out of 1250 copies of the questionnaire distributed, 1237 were returned representing 87 per cent return rate and were used for data analysis. The response columns of ACSUQ were allocated scores as follows: AL = 4, OC = 3, RA = 2 and NE = 1 as the case may be. Research questions were answered using mean and standard deviation. Olaitan’s criterion mean of 2.5 adapted for 4-point scaled instruments was applied to categorize extent of utilization of antenatal services for the purposes of description and to answer research questions . This implies that any mean below 2.5 was considered as low level utilization while any mean of 2.5 or above was considered high level utilization of antenatal care services. The hypotheses were tested using one-way analysis of variance (ANOVA) at 0.05 level of significance. Table 1 presents result on extent of utilization of ANC services among child bearing mothers in Anambra State Nigeria. The table shows that mean score for each of the items in the ANC service utilization was above the criterion mean ( x =2.5) set for the study which indicates a high utilization of ANC services by child bearing mothers in Anambra State. It also shows that the ANC service more utilized is receiving health talks with a mean score of 3.64, while HIV/AIDS and STD services were the least utilized. Cumulative utilization of antenatal care services indicates high utilization with a mean score of 3.60. Table 2 presents results on the extent of utilization of antenatal care services by age of mothers in Anambra State Nigeria. The result indicates that mothers in the entire age groups had mean scores above the criterion mean ( x =2.5) set for the study which indicates a high utilization of antenatal health services. Amongst all, the highest extent of utilization of these services was among mothers aged 15-24 with a means score of 3.77, followed by mothers aged 35-44 with a mean score of 3.67; mothers aged 45 and above had a mean score of 3.58; the least level of utilization was amongst mothers aged 25-34 with a mean score of 3.51. The antenatal care services with the lowest extent of utilization are the HIV/AIDS and STDs treatment and voluntary HIV testing and counseling services and it was accounted for by the age group 25-34 with mean scores of 2.80 and 2.77 respectively. Data in table 4 presents the summary of ANOVA on the extent of utilization of ANC services by age and level of education of mothers in Anambra State Nigeria. The result shows that there was a significant difference in the extent of utilization of ANC services by mothers in Anambra State Nigeria by age of child bearing mothers since the f-cal. (17.514) is greater than the f-critical (2.6) at 0.05 level of significance. The summary of ANOVA in table 4 also indicates that there was a significant difference in extent of utilization of ANC services among child bearing mothers by their level of educational attainment; the f-cal. (16.609) is the greater than the f-critical (2.6) at 0.05 level of significance. This study sought to determine the extent of utilization of ANC services among child bearing mothers in Anambra State of Nigeria. It also investigated the difference in utilization based on age and level of educational attainment of the mothers and tested whether the differences where significant. Table 1 gave a summary of the extent of utilization of each of the ANC services. The cumulative mean value of 3.60 indicates a high extent of utilization of these services. This finding is in agreement with the report of the NDHS which observed that even though there is low utilization of ANC in Nigeria, that 9 in every woman in South-East Nigeria (where Anambra State is located) accessed ANC service from skilled providers . Even with this observed level of utilization of ANC it is still worrisome that utilization is not full considering the irreplaceable place of antenatal care in ensuring healthy outcomes for a mother and her child [5-7]. Many reasons has been adduced for low utilization of these services, according to Awusi, Anyanwu and Okeleke these may include, lack of maturation, non-accessibility, cultural and negative roles played by husbands . Fekede and Mariam in their study reported a high level of utilization of ANC services among child bearing mothers, and in order to ensure maximum utilization of ANC services, they proposed effective behavior change communication focused on the different segments of child bearing mothers . Another interesting finding on table 1 is that the lowest utilized services were those related to HIV/AIDS and STIs. The mean score for voluntary HIV testing and counseling was 3.06 while treatment of HIV/AID and STIs had the lowest mean utilization (2.91), this finding is in line with the finding of Idigbe et al. that only 16.3% of those attending a health facility had used voluntary testing service . Rogers et al. study suggests that this might be a consequence of wrong perception of HIV risk because in there study about 97% of women did not perceive themselves at risk of HIV infection . The implication this is that those who do not utilize these services might contribute to the dangers of STIs in pregnancy and Mother to Child transmission of HIV. Adeleye et al. are of the opinion that health education is the solution to this, according to them following a health education intervention in a population of mothers, a greater number of participants during the intervention were willing to utilize these services . The mean scores in table 2 for all the age groups were above the criterion mean of 2.5 with mothers aged 15-24 having the highest mean score of 3.77; followed by mothers aged 34-44 with mean score of 3.67; those aged 45 and above had a mean score of 3.58 while those aged 25-35 had the least level of utilization with a mean score of 3.51. These findings present patterns that do agree completely with the data in the NDHS, the finding that mothers aged 15-24 had the highest extent of utilization of ANC services is not in agreement with the NDHS findings which reported that 46% of mothers aged 20 years and below do not access antenatal care services . The age categorization in this study might have contributed to the result since it included ages of 15-24 an age group that included those 21-24 years who might be having their first baby in marriage and are known to have high attendance to ANC . It was also found that the least level of utilization is among mothers aged 25-34; this is worrisome since the bulk of childbearing mothers are among this age group. The NDHS reported a 68% attendance to antenatal for this age group which is not reflected in the findings of this study . With the result of this finding, the implication is that other factors might have contributed to the disagreement in these findings. Mathole et al. assertion that the motivation for mothers aged 35 and below to access antenatal care was more for reassurance that their babies are growing well, might be a good example of such factors . Again, Simkhada et al. are of the opinion that merely presenting for ANC check-ups does not ensure utilization of ANC services since contact may not translate to quality care. It is also worth of note that the age group 25-34 had the least level utilization for HIV/AIDS and STI related services with a mean score of 2.77 for utilization of voluntary HIV testing and counseling, 2.80 for treatment of HIV/AID and STIs. This finding has implications for HIV/AIDS and STI control especially Prevention of Mother to Child Transmission (PMTCT). Table 3 indicates that mothers in every level of educational attainment had a mean score above the criterion mean an indication of high utilization of antenatal care services, this finding is in line with the findings of NDHS and the position of Simkhada et al., that education was the best predictor of ANC service utilization [7,19]. The table also shows progressive increase in the level of utilization according to level of education of mothers except for mothers with non-formal education having a higher mean score than those with primary education (3.44 and 3.31 respectively). This might have been accounted for by the poor quality of education in Nigeria which does not equip somebody with a primary education with enough competence over somebody with non-formal education and therefore has implication for health education of mothers. 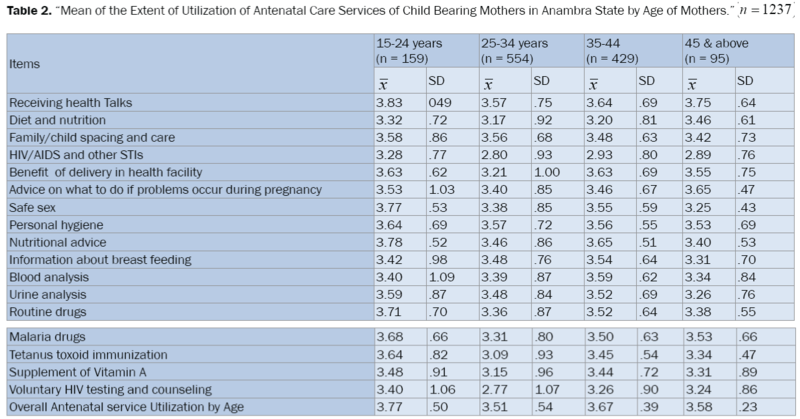 Table 4 presents the test of hypothesis of no significant difference of in the extent of utilization of antenatal care services among child bearing mothers in Anambra State by the socio-demographic variables of age and level of education of mothers. The result shows that both variables returned a significant difference in the extent of utilization of ANC services. This implies therefore, the need to intervene to improve utilization along the line of these socio-demographic variables to ensure optimum utilization ANC services. The findings of the study indicate a high extent of utilization of ANC service among childbearing mothers in Anambra State of Nigeria and that the extent of utilization was significantly different by age and educational level of mothers. It also revealed that the most poorly utilized services are those related to HIV/AIDS and STIs; that mothers aged 25-34 had the lowest level of utilization of ANC services and that mothers with no formal education utilized ANC services higher than those who had primary education. It was also observed that even though this study reported a high extent of utilization of ANC services, it submits that that level is still not good enough considering the important place of ANC services in ensuring healthy outcomes for mothers and their newborns. These findings have implication for maternal health care service delivery in Nigeria and have implications for maternal health education. • Since there is need for a full utilization of ANC services, that behaviour change communication interventions be intensified both by the national, state and local government health agencies to provide proper knowledge among mothers on the importance of ANC services and the need for them to access them. • In the provision of health education to childbearing mothers, that the presentation of fact must be age specific and targeting bias and false assumptions held by these age specific groups and addressing them through behaviour change communication interventions. • Governments and non-governmental agencies working on gender rights should propose policies and interventions that will encourage girl child education since education has been identified as the highest predictor that a mother will utilize ANC services. • Integration of maternal and child health education into secondary school curriculum, so that young people especially girls are equip early with information that will position them to act responsibly in matters relating to maternal and child health including ANC service utilization. • Intensification of HIV/AIDS and STI awareness campaign by the Nigerian National Action Committee on HIV/AIDS (NACA) in collaboration with maternal health care services providing institutions to improve uptake service for the prevention of HIV/ AIDS and STIs for general public but most especially for childbearing mothers. • Studies should be conducted by interested researchers to understand the attitudinal and behavioral issues that affect the uptake and utilization of ANC services in Nigeria and other developing countries and also to determine the quality of ANC services provided for these mothers. Safe Motherhood.[www.safemotherhood.org]. Priorities of safe motherhood. [Cited 2015 June 2]. WHO/UNICEF. Antenatal care in developing countries: Promises, achievements, and missed opportunities-analysis of trends, levels and differentials, 1990-2001. Geneva: WHO. 2003. .Fekede B and Mariam A. Antenatal care services utilization and factors associated in Jimma Town (South West Ethiopia) Ethiopia Medical Journal. 2007;45:123-133. Bulatoo RA and Ross JA. Rating maternal and neonatal health program in developing countries. Carolina: University of North Carolina. 2000. Jowett M. Safe motherhood interventions in low-income countries: An economic justification and evidence of cost-effectiveness. Health policy. 2000;53:201-225. National Population Commission (NPC) Nigeria. Nigeria Demographic and Health Survey, 2013. Calverton Maryland: National Population Commission and ORC/Macro. 2013. Kurjak A and Bekavac I. Perinatal problems in developing countries: Lessons learned and future challenges. Journal of Reproductive Medicine. 2001;29:179-187. Nwosu EO, Urama NE, et al. Determinants of antenatal care services utilization in Nigeria. Developing Country Studies. 2012;2:41-52. National Population Commission. National and state population’s projection, 1999 analysis. Abuja: United Nations Population Fund. 2004. Olaitan SO. (1983). Factors associated with non-utilization of hospital services for antenatal care by pregnant women in rural communities of Anambra State of Nigeria. In: Okobiah OS, Ali A, Onuoha GBI, Editors. Occasional publication of Institute of Education, University of Nigeria, Nsukka (No. 4).Nsukka: Institute of Education, University of Nigeria, pp. 65-70; 1983. Awusi V, Anyanwu E, et al. Determinants of antenatal care services utilization in Emevor village, Delta State, Nigeria. Benin Journal of Postgraduate Medicine 2009;11:234-240. Idegbe EO, Ibrahim MM, et al. HIV/AIDS in Nigeria: Survey of health and laboratory facilities, 1989-1999. Technical Report of (Federal Ministry of Science & Technology), College of Medicine Press, University of Lagos, Nigeria. 2000. Rogers A, Meundi A, et al. HIV-related knowledge, attitudes, perceived benefits, and risk of HIV testing among pregnant women in rural Southern India. AIDS Patient Care and STDs. 2006;20:803-811. Adeleye AK, Mafe MA, et al. Knowledge and perception of HIV/AIDS among pregnant women attending antenatal clinics in Ogun State, Nigeria. African Journal of AIDS Research 2006;5:273-279. Magadi MA, Madise NJ, et al. Frequency and timing of antenatal care in Kenya: Explaining the variations between women of different communities. Social Science & Medicine. 2000;51:551-561. Mathole T, Lindmark G, et al. A qualitative study of women’s perspectives of antenatal care in a rural area of Zimbabwe. Midwifery. 2004;20:122-132. Simkhada B, Van Teijlingen ER, et al. Factors affecting utilization of antenatal care in developing countries: A systematic review of literature. Journal of Advanced Nursing. 2008;61:244-260.